Like many others, the Trayvon Martin case has me longing for a time when Hip-Hop really was the “CNN of Black America.” In fact, the case often has me thinking back a couple of decades, when another incident of racial violence divided the country. The incident in question was caught on tape, and though the perpetrators were brought to justice, they were ultimately acquitted of all charges. Los Angeles was nearly razed to the ground in the trails immediate aftermath. The entire nation froze, wondering if and when the violence would cease. Anyone who’d been listening to rap music for the few years prior to events understood just what was happening and why. 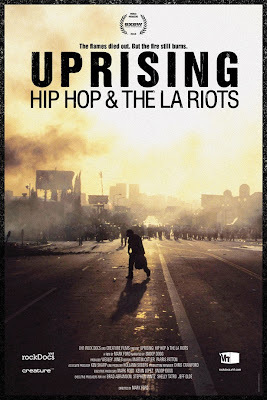 Uprising: Hip Hop & The LA Riots puts the events that began on April 29th, 1992 under a microscope. When the four LAPD officers caught on tape beating motorist Rodney King were acquitted by a jury of their peers, the City of Angels exploded. The civil unrest lasted for six days, during which time much property was destroyed and many lives were lost. The uprising was the logical conclusion to racial tensions that had been simmering decades. Those tensions were exacerbated by a police force that Black and Brown Los Angelenos had to come see as a brutal gestapo. Those sentiments and more were expressed in the West Coast Gangsta rap that anticipated the uprising. Right off the bat, the trailer for Uprising: Hip Hop & The LA Riots puts viewers at ease by featuring a qualified roster of talking heads. John Singleton, Nas, KRS-1, Ice-T all look back in hindsight and offer their take. All of this is transposed with home video footage offering a ground zero perspective and featuring ordinary citizens shouting all manner of threats and declarations into the camera as violence swirls around them. It’s both inspiring and chilling. The most compelling moments feature one of the men responsible for beating Reginald Denny to a bloody pulp. His honest and unapologetic testimonial inspires mixed feelings. I understand where he’s coming from, but I detest the way in which he chose to act on his instincts. From the looks of things, Uprising: Hip Hop & The LA Riots is a work that demands to be seen. I will definitely be watching as the memory of VH1’s last Hip-Hop related Rock Doc, Planet Rock, The Story of Hip Hop and the Crack Generation, is still fresh in my mind. Uprising looks to pack a similar punch. As harrowing as the images in the trailer are, I’m game. While we collectively fume over the developments of the Trayvon Martin case, it’s important that both we and the powers that be reflect on just how bad these things can get. Some of us are willing to do much more than talk. Some of us are tired of asking and waiting. Some of us want change. Uprising: Hip Hop & The LA Riots airs on May 1st at 9pm ET/PT.